I want to help you find affordable and well designed furniture, light fixtures, etc. for your home decorating by sharing my library of furnishings I have accumulated over the years and new ones I come across on a daily basis. Hope you find it helpful! If you have any questions or suggestions, I'd love to hear from you. Loving the look of this storage unit. Clean structural look floats on a framed six-legged base with windowpane styling that makes a great architectural statement in clear glass and black steel. Showcase prized pieces on adjustable shelves, away from dust and on view behind paired glass doors, latched with no-nonsense industrial-inspired hardware. Named Product of the Year at the FX International Interior Design Awards in the year of its release, the often copied LEM Piston Stool reveals a rigorous and original rethinking of the form and function of seating. The sculptural seat not only swivels but also adjusts easily from counter height to bar height with a lever that activates a gas cylinder. While utility strongly determines its form, this unique stool also has a visual lightness that creates the illusion of freedom from gravity. Made in Italy. It's seat height works for 36" to 42" high counters. Comes in black or white. DWR $750 (June 2014). Dimensions: H 29"–34" W 15" D 17" Seat H 26"–31"
Sleek and modern, this contemporary bedroom furniture features clean lines and polished surfaces with just a touch of upholstery to soften the look. 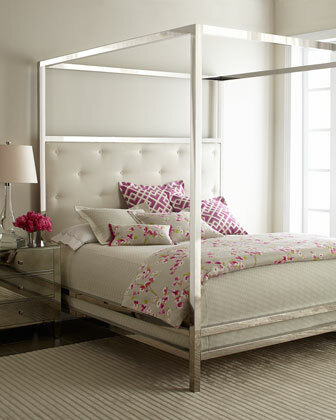 Polished, stainless steel canopy beds have button-tufted bonded-leather-upholstered headboards. Queen bed, 66"W x 86"D x 90"T. Boxed weight, approximately 280 lbs. King bed, 82"W x 86"D x 90"T. Boxed weight, approximately 290 lbs. Beds require use of box spring (not included). Petite enough to fit on small balconies, but big on comfort, the Crest chair creates the perfect outdoor lounging spot. A hidden swivel base lets you enjoy a 360-degree view, while the durable Sunbrella® fabric will stay looking great season after season. Stocked in yellow fabric. But also comes in other Sunbrella fabric colors and/or patterns as special order. Spring's here. Time to start thinking about outdoor entertainment. Hello! I'm a professional Interior Architect/Interior Designer in San Francisco, CA - U.S.A. My company, MP DESIGN, focuses on residential interior architecture and small commercial interiors projects such as cafes/restaurants, office spaces, etc. Check out my company website at www.mpdesign.com if you are interested. Awesome Inc. theme. Theme images by NickS. Powered by Blogger.